Recent studies have even shown the physical and emotional benefits of spending time in the natural world. Local nonprofit Wild Grief has put this knowledge to action by facilitating peer groups for kids and adults who are grieving a death by offering space for sharing, connecting, and healing in nature. 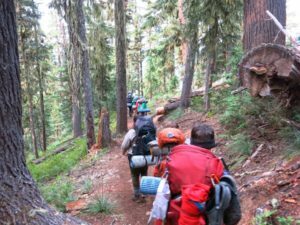 So each month, facilitators from this entirely volunteer-run group host a “hike habit” – a chance to connect with other grievers while hiking in nature around Thurston County. “It’s a lot easier to talk about something heavy when you’re walking side by side with someone,” says president Breanna Trygg about grief and hiking. Wild Grief began their monthly hike habits last January, and their August hike was their largest groups yet with 21 participants. 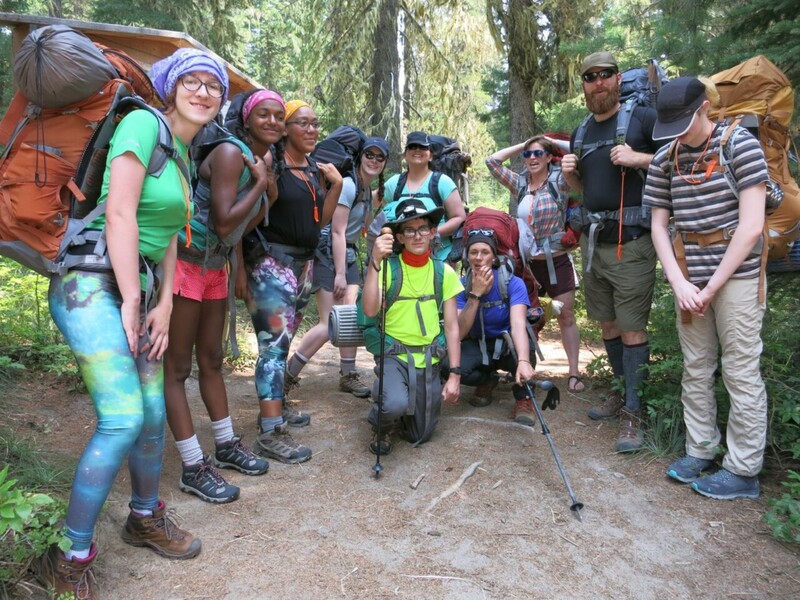 Also in August, Wild Grief facilitated two teen wilderness treks in the Goat Rocks area of the South Cascades. 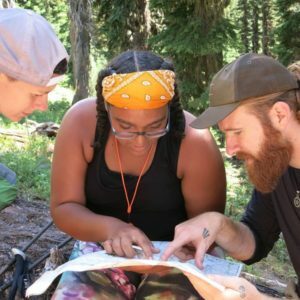 This was their first year guiding backpacking trips for teens. 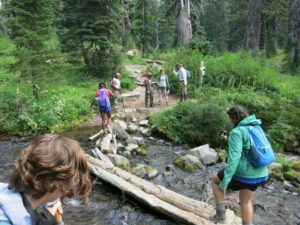 The first group this year had seven youth hikers, and the second had five hikers, accompanied by four adult guides each with different skills in grief facilitation, wilderness leadership, and survival. “But I’m always astonished how fast the group forms. We introduce them to each other and we say here’s an opportunity that you may not get again. You’re with a bunch of people that you don’t have to explain yourself to. This isn’t like school. You don’t have to be guarded. Just be kind to each other. And they just grab that and they’re totally kind to each other. It’s kind of magical,” Jim adds. 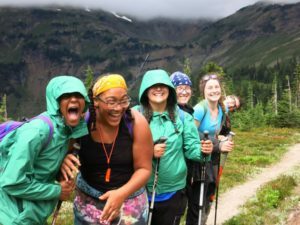 Wild Grief offers these backpacking trips at no cost to teens or their families, thanks to grant funding from the Safe Crossings Foundation, the Nisqually Tribe, and the Washington Trails Association, who provided a food grant plus backpacks and gear from their equipment bank. Many of the organizers behind Wild Grief have been impacted by loss at some point in their lives, and they all met through their work with Sound Care Kids, a local grief support group for families and children. Breanna, who lost her dad as a kid and went to a children’s grief group, says she is lucky to have that experience and to know the impact it can have. Jim, who lost his mother at age 10, says he did not experience much grief support, but that it was the wilderness that really saved him. “I was kind of lost for 15 years, then I started really being in the wilderness, in Alaska. I was a biologist. That brought me back to ground,” he says. It was during their mutual work in Sound Care Kids that Jim suggested wilderness trips as another kind of support group. More information on upcoming monthly hike habits, quarterly day-hikes, and other events can be found on their website and the Wild Grief Facebook page.